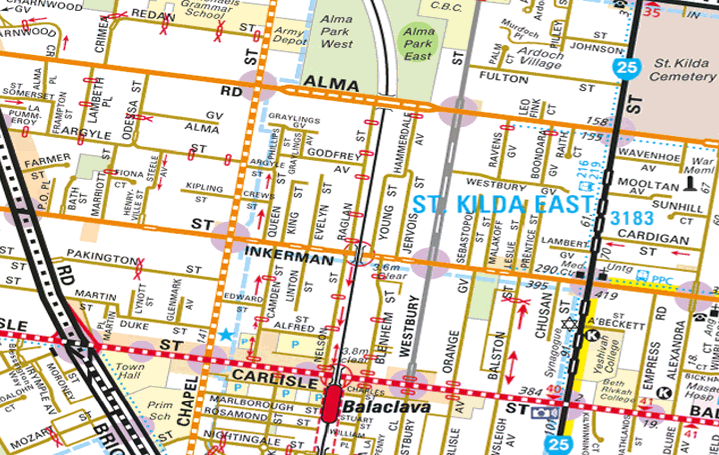 Hearing the news of the ongoing crisis in Ukraine has an added dimension for someone who grew up in East St Kilda. Lots of street names in the area come from the Crimean War — from the British forces, names of battles (which in turn are mostly named after locations), and even Florence Nightingale is in there. Alma Road — The Battle of Alma, 1854. Balaclava (the suburb and the station, as well as Balaclava Road) — the Battle of Balaclava, 1854, near the city of Balaklava. Blenheim Street — perhaps after the Vengeur-Class battle gun ship HMS Blenheim which served in the Crimean War. Cardigan Street — Earl of Cardigan, who led the charge of the Light Brigade at the Battle of Balaclava. Crimea Street — the Crimean War, 1853-1856. Inkerman Street — the town of Inkerman in the Crimea. Malakoff Street — The Battle of Malakoff, 1855. Nightingale Street — Florence Nightingale, prominent nurse in the Crimean War. Odessa Street — Odessa, Ukraine. Pakington Street — Sir John Pakington, secretary of state for war in the British government, and involved in several government reports into the war. Raglan Street — Lord Raglan, commander of British forces in the war. Redan Street — The Battle of Great Redan, 1855. Sebastopol Street — The Siege of Sevastopol, 1854-55. Westbury Grove and Westbury Street — Frank Atha Westbury, who served in the Crimea before emigrating to Melbourne in 1866. Any others people have spotted? ← Previous Previous post: See something newsworthy? Get the footage! The eighth duke of Argyle (or Argyll as it’s now spelt) commanded the highland forces in the Crimea. Frampton, Major Heathfield James late 50th Regiment, won the Légion d’Honneur in the Crimea war. Lucan Street: George Bingham, 3rd Earl of Lucan. He was responsible for giving the fateful order during the Battle of Balaclava in October 1854 which led to the Light division commander, the Earl of Cardigan, leading the fateful Charge of the Light Brigade. The ghost that haunts the old mall in Adelaide was a decorated veteran of the Crimean war. Mooltan there is a bit of a ring-in because the war there was in 1849. And Nelson and Marlborough also get a look-in too. How amazing. Thanks for that Daniel. I can’t see the Melbourne planning authorities naming streets in new housing estates after places or battles in Afghanistan. Maybe someone out there can prove me wrong! You get the same in many C19th streets and pubs here in Britain, too, of course. Sevastopol, Raglan, Inkerman, Alma and Nightingale are especially popular. The French, being on our side in the war, have a lot as well, notably the pont d’alma in. Paris and the nearby Alma tunnel! now better known as where the Princess of Wales was killed. @Roger. No planning authority in the days when those streets were named. It’s even more interesting as a whole series of developers would have been involved – all choosing to pick names from the Crimea. Just shows how the war captured the Victorian imagination. Very sad to see no Flashman Street – how could they have missed that? Alma, Thin Red Line, charge of the Heavy Brigade, AND the Light Brigade. Certainly no planning permission to name streets needed in the first decades of white settlement in Melbourne. If you look at the streets around Swinburne University of Technology you’ll find William and Henry Streets both of which were named after the gentleman who owned the estate.